NOBODY WANTS TO SET UP ON SOMEONE ELSES LAND! We got a pretty big island with a lot of resources and place for a bunch of settlers. If they ask, we explain friendly our rules and usually they're building the taming areas etc and do their stuff. All are happy. If they don't ask and build up their structures too close or in our little village, they have to wonder about, where their stuff is gone. As easy as it is. We won the island-race and pay now the island upkeep. That give us the rights to keep our place clean. Yesterday the Same Problem. tried to log in for 45min until it worked... Befor the small Patch Yesterday i never had some problems. 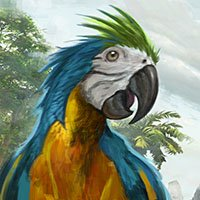 Do settlers decrease island upkeep? We payed around 360 gold for claiming the island. The upkeep cost is 274 gold every 12h (without a settler on). It's very expensive on the first look. But when u got a company (and u need 10ppl in your company to claim an island this big) it's easy made. Farmed a few treasures yesterday and got some gold for ~3 days. Time enough to hunt whales or build around houses and ships. First we had to pay every 12h. Now, with a few settlers on, time raised to 14h. Go buy the game and play it first... Then u would not ask some silly bs. Yesterday i had to fill up my stone-water-reservoirs by hand. Tooked three jars, a shovel and a lot of time. We also got a desert-island and this was the only way we could grow some wheat. The devs definitely hafe to take an eye on this. -implying some personal fountain? -implying several small freshwater-spots? -repair the stone barrels? -let it rain (not so often, because it's desert, but sometimes a little shower...?) At least: please fix it. Island owners can demolish anyone at any time ? Dude in a pvp Server u have to fight for what's yours. Once u're the landlord of a settlement, u can make your own rules. If you want to build on a island and be sure to be safe: go for it. Defeat the enemy of the island and build your own fortress. Place towers, bunkers and other defence and start to pray that's enough for the next challanger... ...or simply play on pve. It worked fine. But if the ship is too close to a port or else it's not working. Tried a few scenarios yesterday and yes: sometimes it takes two or more whistles until it works.